Real life is not binary. Nine pictures generate endless stories. Create your own story—and share it. An online community for our readers. There's wisdom in groups. The group as a whole knows more than you do. Webinars can and should incorporate activities. There is a big difference between online training sessions (webinars) for groups of less than 20 and groups of more than 50. Most participants have varying amounts of expertise and experience on most training topics. Most participants are also capable of taking a basic idea and working out details of transfer and application. By explaining too much, trainers deny opportunities for participants to share what they know and how they plan to use it. Based on these principles, we have created an online structured sharing activity incorporating the concept of Self-Directed Learning Teams (SDLT). Here's the flow of this activity. Brief the participants. Explain that you are going to help the participants explore 30 different techniques for reducing the amount of trainers' talk and increasing the amount of participants' learning. Point out that some of your participants will know more than others about each specific technique. Announce that you are going to conduct an activity that encourages people to share what they know and what they want to know. What excites you about this technique? Have you ever used or experienced this technique? What additional details do you know about this technique? How would you use this technique? What aspects of this technique make you uncomfortable? Why will it not work for you? How would you modify this technique to better suit your needs? Explain the two-group system. Point out that during most online chats, participants focus on typing a whole slew of comments so that they don't have time to read other people's comments. To prevent this from happening, you are going to divide the participants into two groups of approximately equal size. During the discussion of a specific technique, one group (known as the commentators) will type their comments. The other group (known as readers) will keep their hands off the keyboard. Instead of typing their own comments, they will carefully read, process, and organize the comments made by the other team. They will make a mental note of the more interesting comments. During the discussion of the next technique, the groups will change their roles: The commentators will become the readers and the readers will have their turn at typing comments. Explain the time limit. To prevent the discussions from going on and on, announce a 3-minute time limit. Encourage the participants to manage their time wisely and stay on task. Divide participants into two groups. Explain that one group will be called the AM group and the other will be called the NZ group. Participants whose last names begin with the letters A through M belong to the AM group. The rest of the participants (with their last names beginning with the letters N through Z) belong to the NZ group. Explain that for the discussion of the first technique, the AM group will act as commentators and NZ group will act as the readers. Display a brief description of the first technique. Project a slide with the description of the first technique. Don't insult the participants by reading aloud what's on the screen. Tell the AM group, “Go to it,” and invite the NZ group to sit back, relax, read, and process the comments. Conclude the first discussion. Read the typed comments as the conversation progresses. Keep an eye on the timer. Announce a 30-second warning. Conclude the session at the end of 3 minutes. Invoke the Ziegarnik principle. Give your rationale for the somewhat arbitrary conclusion: According to Bluma Ziegarnik, people remember unfinished business longer than finished business. Also, the brain needs to incubate the ideas that are already generated, rather than fill up with more ideas. Make your comments. Reinforce useful and accurate comments made by the group. If any of the comments are misleading, make gentle corrections. Repeat the process. Move on to the next technique. Ask the groups to exchange their roles of commentators and readers. Display the next technique and ask the NZ group members to conduct their typed discussion. Continue the activity. About an hour will be the suitable time for this activity. Stop the activity 5 minutes before the scheduled closing time. Explain that you are going to conclude the session. Give the participants the complete list of the 30 techniques and explain that they may continue exploring these ideas. ABLA: Assessment Based Learning Activity. Administer a test. Those who answered an item correctly teach those who did not. If nobody answered an item correctly, then you (the trainer) teach. I once had someone administer the MBTI instrument and walk the participants through a self-scoring-and-interpretation process. Is this an example of ABLA? More active, participant centered. All learn from each other. Beginning with a test is not good for adults. Participants just share their ignorance. Won't work with all topics. Will work with factual learning and computational skills. Opportunity to hear stories from other participants. Making sure that content is understood. Use open-ended questions. No incorrect answers. Everyone discusses. How can we ensure that everyone gets the same information? This approach can also be used in a face-to-face setting. We will describe such an application in the next issue of the newsletter. Instead of short discussions of different items, we can schedule a lengthier discussion of a single item. I think I read about this activity in Dan Gilbert's book Stumbling on Happiness , but I am not able to find the exact location. This jolt demonstrates that people are able to perform better when they believe that things are getting better. Participants take one vision test using a traditional eye chart and record their results. Then they take a second vision test using an eye chart which has the letters printed in the reverse order (from the smallest to the largest) and record their new results. To explore the impact of increasing or decreasing levels of difficulty on individual performance. 3 minutes for the activity, 2 minutes for the debriefing. Two Eye Test Charts (37K PDF). Page 1 is a “traditional” chart, with letters that start large and finish small. Page 2 is an “inverted” chart, with letters that start small and finish large. Attach the charts on the wall at the average participant's eye level. Measure 20 feet away from the chart and mark this spot on the floor. Participants take the eye test. Ask the participants to pair up with someone. Ask Partner A to cover one eye, stand at the mark on the floor, and read aloud the letters on each line of the chart. Partner B will check Partner A's performance and make a note of the line at which Partner A inaccurately identifies more than 50 percent of the letters. Partner B's turn. Now partner B covers one eye, stands on the mark, and reads the letters on each line. Partner A checks the eye chart for accuracy and makes a note of the line at which the partner misses more than 50 percent of the letters. Change eye charts. Replace the previous eye chart with the inverted chart that has small letters at the top of the chart and progressively larger letters at the bottom. Partners repeat eye exam as before. Use the same procedure to jot down the line at which each partner makes more than 50 percent errors. Ask the participants why they think they were able to read smaller letters when they knew the task was getting easier. Invite participants with an opposing point of view to share their opinions and present some evidence to support them. Ask participants to speculate on the training applications of the principle of proceeding from the hardest to the easiest. People perform better when they know things are getting easier, not more difficult. Here's an energizer that gives your participants an opportunity to think on their feet and see how others act under pressure. Koosh ball (or some other soft thing that can be thrown and caught). 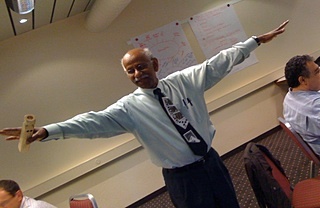 Ask participants to stand in a circle. Pick a category such as a product, service, issue, or any topic relevant to what was discussed in the workshop. Throw the ball to a participant. The participant who catches the ball must say something relevant about the topic. After saying something, the participant throws the ball to another participant. Continue this process for 5 minutes. Change the category and play the game again. Reprinted from the December 2010 issue of Firefly News Flash by permission of the author. This month, randomness enhances creativity beginning with this 99-Word Story. A binary system is OK for computers, but in real life there is wiggle room. A lot can happen between on and off, left and right, liberal and conservative. How often do we needlessly confine ourselves to only two options? If you've ever heard this request and been stumped after, “Once upon a time,” you already have a reason to try out Rory's Story Cubes: nine dice featuring 54 iconographic pictures that are sure to evoke a tale. Roll them across the table and string them together to weave a one-of-a-kind story. Story Cubes come in a pocket-sized box convenient to bring to any social event, team meeting, or just to keep handy whenever you need some extra inspiration or fun. Roll all nine cubes and make a story or deal the dice and let people roll one on their turn to advance the story. If you are teaching, announce a theme related to the training topic and challenge people to tell a story that fits. Roll the cubes and create a story about how your team solved a problem or marketed a particular product. Take them to your next coaching session and ask your protégé to tell a story about how to address a burning issue. 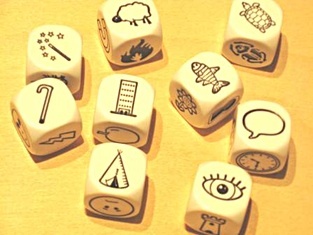 Keep a few cubes in your pocket and roll a story to inspire your next project. The uses for these cubes and the stories they evoke are endless—especially when you realize the tiny pictures can be used both at face value and metaphorically. The images are flexible enough to be enjoyed by a variety of ages, abilities, and cultural backgrounds. Once you hold them in your hand, you'll want to tell a story too! Stories can be an economical way to share information, convey an idea, enhance memory, rehearse new concepts, and have fun. Several other issues of this newsletter have been devoted to the value stories can add to learning and creativity. In addition, the 99-Word story that begins each month's entry is an example of how stories can set the stage by providing a grounded context. 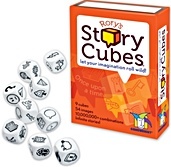 Rory's Story Cubes offer an interesting twist to the value of stories. 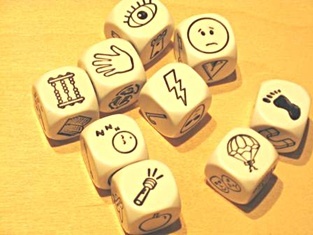 By introducing a random roll of the dice, players have an added challenge for their creative muscles. They've got to somehow make connections between improbable concepts. The result can be more inventive, surprising, relevant. The effect of chance is a key ingredient for any creative process because it allows for the introduction of new ideas. It's a detour around the rut we usually travel; an antidote for the quotidian. As this month's 99-Word Story suggests, a lot more can happen when there is room to wiggle than we might suspect. And where there's room to wiggle, there's space for random activity as well. If you're ever stuck with a problem, figure out a way to inject some randomness. Let it rule, at least for a short while, then see what new opportunities develop. And when you hit upon the novel, please share your discovery (email Brian)! Now I'll pass Rory's Story Cubes to you! I've already rolled the dice. You simply choose one of the photos below for your turn. Put the dice in any order you wish for your tale then write it up and send me an e-mail. Want an added challenge? Connect your story to a current problem or issue in your workplace. I'll post it on the sample page. I hope to read your story soon! Have fun! Story Cubes, Roll Number One! Story Cubes, Roll Number Two! If you register by February 25th, you save $250 for the 3-day workshop and $115 for the 1-day certification program. As you know from experience, these catchy little mnemonic devices can help learners recall critical information. While some trainers find mnemonics to be effective for recalling information, others are reluctant to use them because of the time it takes to learn the mnemonics and the additional time spent applying them. Do you use mnemonics in your training? What are some of your favorite rhymes, acrostics, or other mnemonics? Aaron: I find that the sillier and the most absurd mnemonic devices work the best. My favorite mnemonic is an acrostic that I use to help our foreign employees familiar with American currency: “Why do Jealous Leaders Have Jovial Girl Friends?” The letters of the words help recall the denomination: W = Washington $1, J = Jefferson $2, L= Lincoln $5, H= Hamilton $10, J= Jackson $20, G = Grant $50, and F = Franklin $100. Tina: Encoding verbal information in a mnemonic device takes time—sometimes more time than it would take to just remember the information in the first place. However, I think mnemonics are a great investment in time when the participants will be using the information regularly. The one I used recently is an alliteration I learned from Thiagi: The four C's of game design: Contrivance, Conflict, Control, and Conclusion. Carolyn: I train in an industry that relies heavily on numbers, and I think numbers can be the toughest challenge to remember. Since my participants are very familiar with phone texting, I use the telephone keypad to build acrostics to help them remember numbers. In this case, each number is matched with the first letter associated with it on the keypad: #2 is A , #3 is D, #4 is G, #5 is J, #6 =M, #7 = T, and 9 = W. Since the number one and zero don't have letters associated with them on the keypad, I have assigned 0 =Z (the last number is assigned the letter), and #1 is I (because the #1 resembles the letter I). Using this mnemonic, the number 7,591,207 becomes: Thomas, the Japanese Walrus, Invited Annabelle, the Zebra, for Tea. Response 8) Humor must be relevant to the group and to the context. More importantly, the trainer must be viewed as “human” and “credible”, i.e. someone who knows the subject, who is comfortable enough with himself or herself, and who can laugh at himself or herself! Response 13) Amusing tales about ourselves can help bridge the distance and differences between the facilitator and participants. There is a caveat to this: Women need to be careful of this practice. Research that I have found states that self-deprecation helps make men more approachable. However, when women do the very same thing, they can be viewed as less competent. As a result of this, I am mindful to tell amusing stories about successes rather than failures. If I do tell of a mistake I made, I always share the solutions or the recovery. Response 28) Self-deprecating humor is a great tool. I use it to set an example of openness as well as to set my participants at ease that even though I am the facilitator, I still have much to learn. Response 19) Make sure humor is not done at the expense of any individual or group. Response 29) Let it be natural. Don't try to force humor if it isn't doesn't occur naturally with the flow of the class. With a lot of help from our friends Ray Jimenez and Gary VanAntwerp, we are happy to announce the launch of Training Games Network, http://TrainingGamesNetwork.com/ an online community dedicated to learning games and performance improvement. Webinars — Enjoy free webinars and workshops with industry leaders. Discussions — Share ideas, challenges and resources with colleagues. Network — Connect and build a personal network of relationships and resources. Groups — Join or form a group focused on its members' common needs, interests, and ideas. Case Studies and Best Practices — Download handouts and references for your library. Podcasts — Listen to interviews with industry leaders. And if none of these groups excite you, you can very easily create a group of your own. There are lots more things happening in this online community. The best way to learn about them is to register (for free) by visiting the Training Games Network ( http://TrainingGamesNetwork.com/ ).